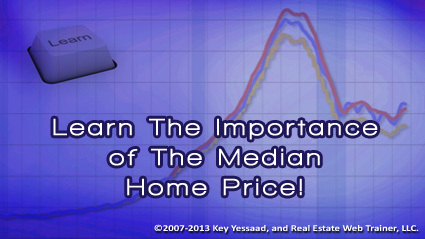 Understanding the difference between the Median Price and the Average Price in Real Estate is very important. The Median Home Price affirms a gauge of affordability in a particular community or city; as well as the health of the local Real Estate Market. Let me first give you the definition of the Median in Mathematical Statistics: The Median is the value or quantity lying at the midpoint of a frequency distribution of observed values or quantities. For example if I take the following 7 values: 162K, 110K, 173K, 165K, 250K, 159K, 560K and wish to find the Median Value, I would sort them out from lowest to highest: 110K, 159K, 162K, 165K, 173K, 250K, 560K and the quantity that lies at the midpoint is: 165K; The Median price of that series of values is 165K; whereas the average (which is found by adding all the values and dividing it by 7) would yield: $225.6K. One of the take aways you should start understanding is that the Median Home Price is more stable and cannot be skewed easily by large Sales or very small values. Imagine I gave you a list of all the single family homes that sold in say Lexington South Carolina in the past 12 months and you calculated the Median Home Price (which is $145K) that gauge will mean that half of all homes sold for less that $145K and the other half sold for more than $145K. This number is not only important in terms what a family can afford in Lexington South Carolina, but it also tells sellers what to expect to sell if they have a typical home in a particular town or community. The Median Home price is very meaningful when Real Estate Agents are farming a particular subdivision; they ought to keep up with it via their MLS – which offers such statistics just for the asking. PS: When you hear that Home Prices nationally or regionally are stabilizing (which they have) what you should take out of it is that The Median Home Price is not going down but it is in fact increasing ever so slightly – it went up nationally by 4.3% as of November 2012.